Collaborate and webcast with two cameras. Works with all conferencing online technology. Reduce hardware complexity and make connectivity simple. 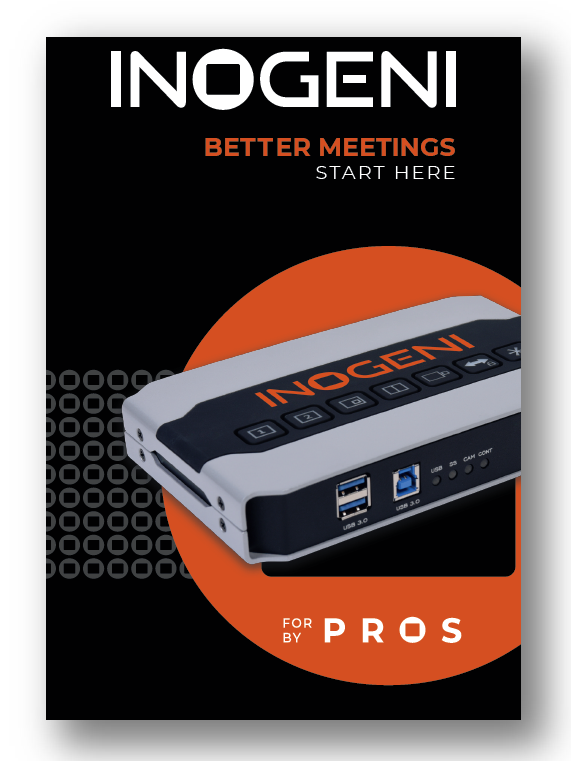 The INOGENI SHARE2 series are plug-and-play video mixers that combine two sources into one stream.­­ This is an important feature especially if your video conference application supports only one input. SHARE2 works with Skype®, Zoom®, webex®, GoTo Meeting®, Livestream® and most video conferencing applications. 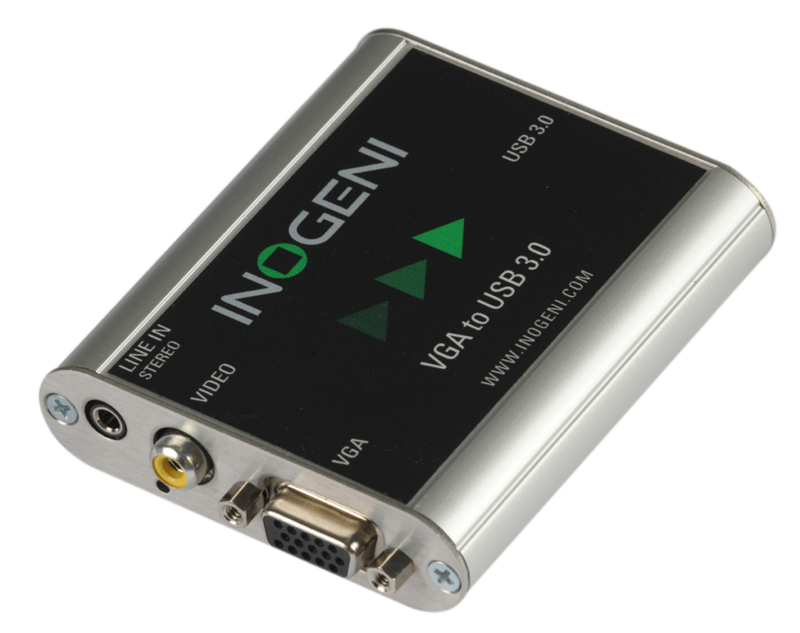 INOGENI SHARE 2U - Simultaneous capture and mix of 2x USB2.0 signals + Audio into one 1080P60 USB3.0 signal. 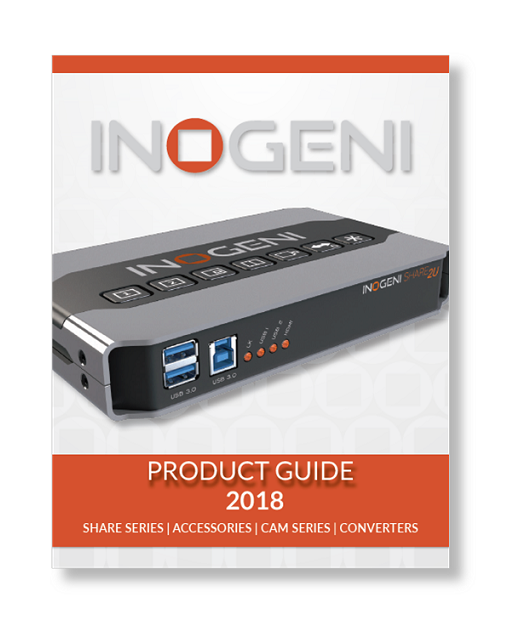 INOGENI SHARE 2 - Simultaneous capture and mix of 1xHDMI and 1xDVI/VGA/Component Analog or digital/or CVBS + Audio into 1x1080P60 USB3.0 signal. The SHARE2 will NOT accept USB cameras. For USB cameras, use the SHARE 2U. The INOGENI SHARE2/U REMOTE is in the same housing as a SHARE2/U. Buttons are on top so it is easy to keep control and move around your studio. All you do is connect the supplied cable between the SHARE2/U Remote and a SHARE2/U. 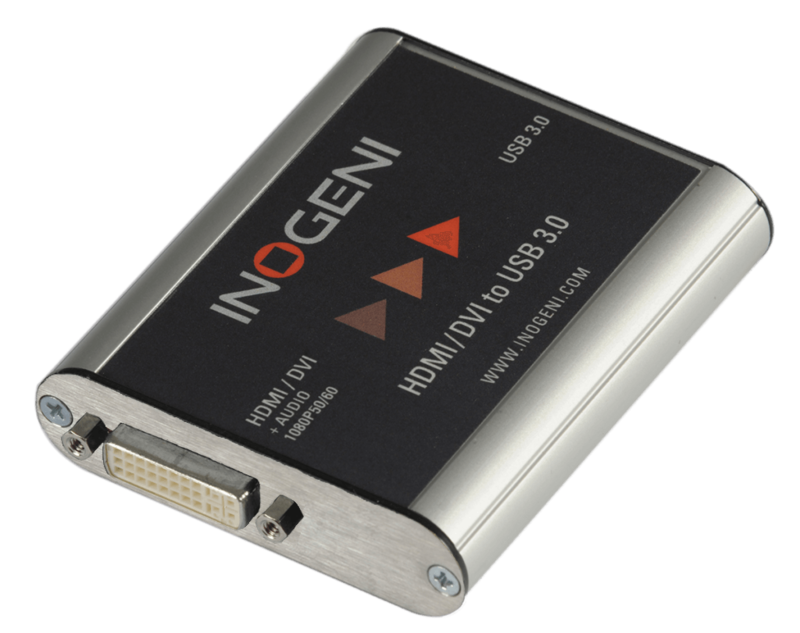 The INOGENI HDMI/DVI to USB 3.0 Converter — FACILITATE your video capture over USB 3.0 for two cameras and with versatile I/Os. Works with vMix, Wirecast, Panopto, Vmix, Wirecast and all apps supporting two or more video input devices. Reduces hardware complexity and connections to your computer. The HDMI to USB 2.0 captures video up to 1080p60 and encodes into a MJPEG stream. The embedded audio in your HDMI signals are extracted and output as two-channel LPCM. 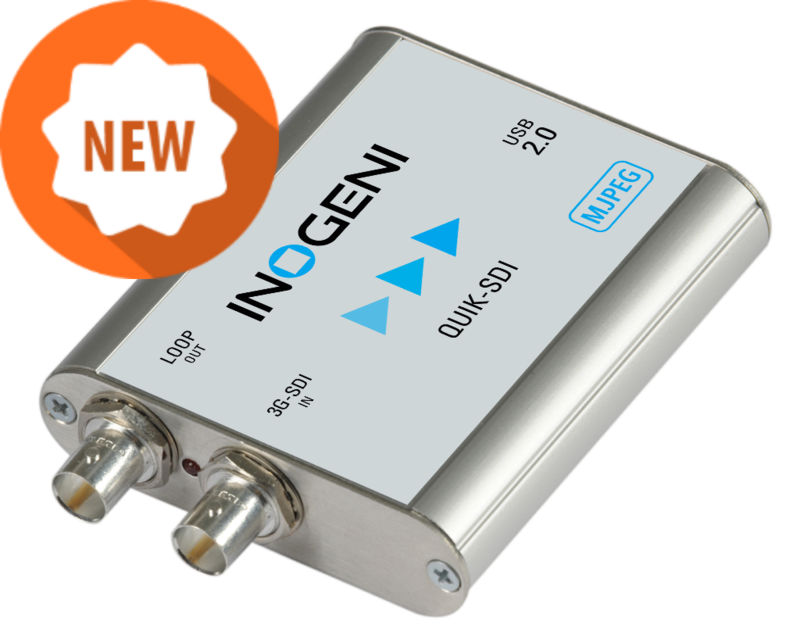 The SDI to USB 2.0 captures video up to 1080p60 and encodes into a MJPEG stream. The embedded audio in your SDI signal is extracted and output as two-channel LPCM. The 4K Ultra HD to USB 3.0 Captures Ultra HD resolutions up to 4K 30fps and 1080p resolutions up to 60 fps. SD and HD resolution signals are converted to 4:2:2 8-bit or 4:2:0 12-bit color spaces over USB 3.0, while all UHD resolution signals are converted to 4:2:0. The embedded audio in your HDMI signals are extracted and output as two-channel LPCM. HDMI/DVI to USB 3.0 captures uncompressed SD and HDTV formats up to 1080p60 and most computer graphic formats from your cameras HDMI/DVI-D output or your PC. Supports 1080p resolutions up to 60 fps. All SD and HD resolution signals are converter to 4:2:2 8 bit color space. The embedded audio in your HDMI signals are extracted and output as two-channel LPCM. 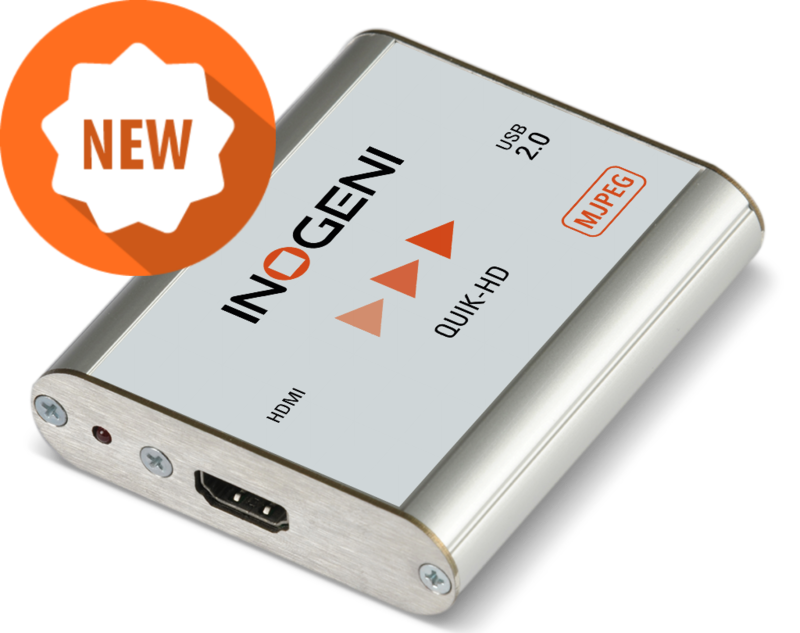 The INOGENI 4K HDMI to USB 3.0 Converts all resolutions up to 1080p resolutions at 60 fps. All SD and HD resolution signals are converted to 4:2:2 8-bit color space over USB 3.0. The embedded audio in your HDMI signals are extracted and output as two-channel LPCM. Field upgradable to 4K. The SDI to USB 3.0 converter supports 1080p resolutions up to 60 fps. All SD and HD resolution signals are converted to 4:2:2 8-bit color space over USB 3.0. The embedded audio in your SDI signal is extracted and output as two-channel LPCM. The VGA/Component/CVBS to USB 3.0 captures SD and HDTV video formats, up to 1080p60, and most computer graphic formats. All SD and HD resolution signals are converted to 4:2:2 8-bit color space over USB 3.0. The line level stereo analog audio input is output as two-channel LPCM.